Bling Nation has announced the launch of its FanConnect service in Austin, Texas, expanding the reach of its social rewards program where consumers can tap to earn, redeem and share rewards with their social networks at checkout with their mobile phone. 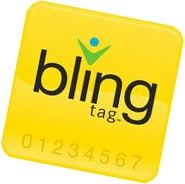 The firm is working with a variety of businesses in the city to allow customers to connect with Bling Nation on Facebook and pick up a BlingTag, an NFC tag that adheres to the back of the phone, to discover deals and get rewarded every time they visit one of the retail partners. Austin is one of the first stops in the national rollout of Bling Nation’s FanConnect service following the launch in the San Francisco Bay Area in November last year and subsequent introduction to Chicago. The company has been running a trial in Palo Alto since July, in conjunction with PayPal. Later on, Facebook began distributing BlingTag stickers to its staff so that they could also take part in the trial. In Austin, Bling Nation is working with Dominican Joe, Jeanie’s Java, Portable, Silver Grill, Simply Fit Meals, 4 Seasons Salon & Spa, Hopdoddy, Sugar Shack BBQ, Bits and Druthers, and Texas French Bread. “Known for its tremendous contributions to technology innovations, Austin is an ideal market for Bling Nation,” says Meyer Malka, co-CEO for Bling Nation. Mehul Patel of the Dominican Joe coffee shop said the Bling Nation service offered his business the ability to “recognise and appreciate our customers, reward them for their loyalty and provide a platform for them to share these rewards with their friends on Facebook”. FanConnect is available to any Austin business. When a business signs up they will receive a starter kit, which includes all the tools needed to implement the program including a voucher printer, BlingTags and merchandising materials.